It’s not often that you can use the term “epic” when describing a musical endeavor, while not simultaneously over-hyping the material. But then again, you rarely come across the musical ambition of a Right Away, Great Captain. It’s not often that a songwriter truly doubles as a storyteller, crafting characters which are just as memorable as their melodies. But then again, Andy Hull isn’t your typical frontman, possessing an intellect worthy of a novelist. And it’s not often that music becomes an experience, one which requires a night of your fullest attention. But then again, most artists don’t create enthralling narratives spanning 36 songs, 5 years and 4 LPs. The Right Away, Great Captain! 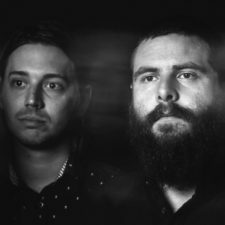 trilogy, crafted mainly by Hull (Manchester Orchestra, Bad Books), is all of those characteristics and much more, combining a minimalist musical triumph with lyrical work that ranks among the best in the scene. His primary narrative, which tells the tale of a devastating betrayal and the consequences that follow, isn’t your run of the mill story, focusing more on the slow emotional breakdown of its protagonist (or antagonist, however you feel), while dispatching of cheap thrills. But if you’re unfamiliar with the story (mostly chronicled through journal entries), there’s plenty to be caught up on. The main character, a 17th century sailor, witnesses his wife and brother engulfed in a passionate affair. Instead of confronting the two, our sailor sets out to sea, the anger slowly building up inside of him. In the opener for “The Bitter End,” entitled “Oh Deceiver,” Hull asks, the frustration seeping ever so slightly through his vocals, “Oh brother/Our blood was so thick/Can you still smile/Into my daughters eyes?” And to his wife, he asks, “Oh inside/You feel like needles/Woman how could you/Do this to me?” The song not only sets up the story, but sets the tone musically, with Hull’s vocals taking center stage, accompanied only by an acoustic guitar. It’s quite a while before you hear anything other than those two instruments. 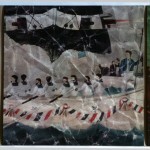 In the second album, “The Eventually Home,” the sailor becomes an opiate addict, eventually losing his mind while developing a murderous urge towards his wife. You first see the slight change in attitude with “Cutting Off The Blood To Ten,” which finds our main character looking back on the unfaithful act, regretting his failure to take action. He sings, “I saw what you were doing/And I wished that I have burnt that goddamn door/Finding both of you on the floor/Realizing your brides a whore/Really takes an enormous toll/On your head.” The second album also signals a change musically, with some added production pulling the sound away from the stripped down feel of the first record. “Devil Dressed In Blue” is your greatest example of this, as an explosion of voices hit the chorus, providing one of the greatest moments in the trilogy. You also see a switch from the acoustic to the electric in “Father Brian Finn,” an alteration which also appears in the final chapter. At the second album’s conclusion, the main character finally returns home, standing over his wife and brother in “I Was A Cage,” looking to finally kill her. After quickly mentioning his addiction with “And it has to been a year since I was sober,” he states, “Its any minute now that I will wake you/Watching a woman sleep can get you scared.” The track, which has a slight ting of grunge-inspired vocals, leads directly into “The Church Of The Good Thief,” the third and final album. And in his final moments, during “Memories From The End Pt. 2,” the sailor seems to come to terms with his death, stating, “And, oh holy ghost, how have I wandered so far from my home/Atonement so clean, replenishing me.” He then finishes out the trilogy with “And now I am shown the treacherous pains to become something whole/Redemption that’s freed the burden from me/Redemption so free discovering me.” The final two tracks bring back that stripped down feel, leading to a conclusion which sounds oddly similar to the experience’s beginnings. When looking at the entire saga — from the plot development to the changes in style — you see an arc which took some serious time to craft and create. And while part three was a bit weaker than the first two, the entire trilogy is still something to marvel at. Most tracks employ a similar stripped down sound, but you never find yourself checking your watch out of boredom. And of 36 tracks, there’s surprisingly few that I would consider skipping during my future experiences with the albums. 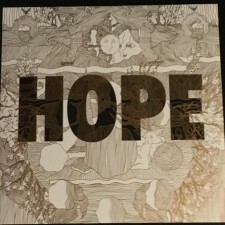 The excellent songwriting carries this project, from the beginning, all the way until the bitter end. Sound Quality: When looking at the sound quality, you have to also remember the changes in the recording of each album. Clearly, from “The Bitter End” to “The Eventually Home,” there was an upgrade in the process. “The Bitter End” isn’t afraid of some slight background hum, which actually adds to the overall experience. It doesn’t sound like a home recording, but instead, it feels as if you’re listening to the songs live. He didn’t record the first album with a studio sound in mind, so that’s not what you’re going to get. “The Eventually Home” is much more refined, as it comes through the speakers crystal clear. “Memories From A Shore” is the perfect example, with Hull’s vocals coming through in a way that just don’t exist on the first album. Among the three, “The Eventually Home” has the loudest mix and is the best mix. 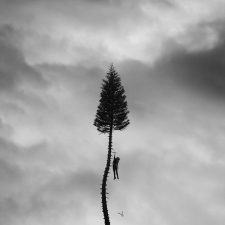 The final album is the only one that sat as a little bit of a disappointment, with the recording and mixing process somewhere between the first two albums. It’s almost as if they didn’t quite know how they wanted to record the final chapter. It has some touches of that refined sound, but it’s just not as sharp as it should be. And like I said, it doesn’t have the full, “home-recorded” sound either. It just kind of sits in the middle. 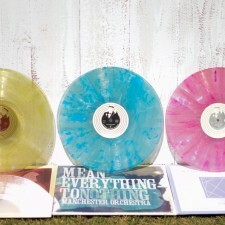 Packaging: When looking at the packaging for this mammoth 4xLP set, I’m torn. On one hand, you have an extremely attractive piece of work, highlighted by the beautifully designed images which mark each individual inside panel. 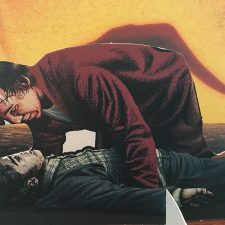 When you add in the three colors of vinyl — opaque orange for “The Bitter End,” blue/grey vinyl for “The Eventually Home,” and opaque green vinyl for “The Church Of The Good Thief” — you have the type of packaging that makes a fan get into vinyl in the first place. I even dug the gatefold jacket, despite the fact that two records were forced to fit into one section. But on the other hand, you have what I think is a major miscue by leaving out the lyrics in the standard version. Andy Hull has crafted an epic trilogy, which relies mostly on the complex, intricate tale he writes. A major reason for purchasing the vinyl set was so I could finally follow along with that tale. And yes, I realize that handwritten lyrics were included in the deluxe package (along with a handmade bronze RAGC whale keychain; and a 6×4 Ryan Russell photo print, signed by Hull). The thing is, you shouldn’t have to spend $120 to receive lyrics. The $70 I paid should have been more than enough. They do provide an insert, but it’s just the basic album information. Each of the sets are signed by Hull and individually numbered on the back cover, which certainly added a nice, personal touch. Extras: The standard package came with digital downloads of each of the three albums. The downloads were the remastered versions created for the vinyl format. 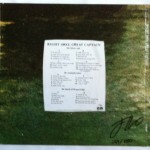 The deluxe edition of the set also featured “RAGC: The Lost Sea,” which includes 14 previously unreleased tracks (available here). Summary: With the Right Away, Great Captain! 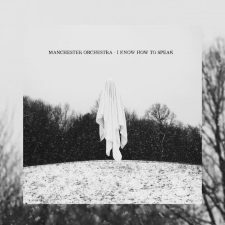 trilogy, Andy Hull has created a work of art which could possibly outlast the rest of his excellent material in Manchester Orchestra and Bad Books. The storytelling is as strong as the musicianship and a charm exists within the tracks that is difficult to duplicate. The packaging and sound quality of the set is impressive, but there were some faults, including the lack of a lyric book. The item is no longer for sale. 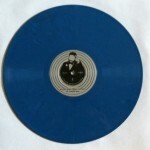 If a repress does occur, Modern Vinyl will be sure to let you know. 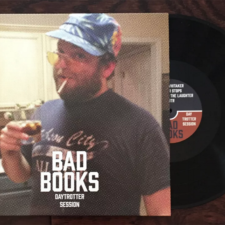 You can listen to the first two albums and a portion of the third, here.